Sample provided by GearChic - as of 4/1/2018, I bought my own! One of the many perks of working at RevZilla.com is access to the Demo Closet, affectionately called the "ZLAset" by those of us on the inside. The graphic I'm wearing is #2, the Race Star. What makes the Race Star a little more special is the outer shell, the eps and the liner system. The outer shell is made of a "3K Carbon (Fiber) Shell" and has a different eps system known as the Flex Impact Liner. The cheek pads are also removable by magnet, which makes thing a bit more convenient for cleaning or headset installs. 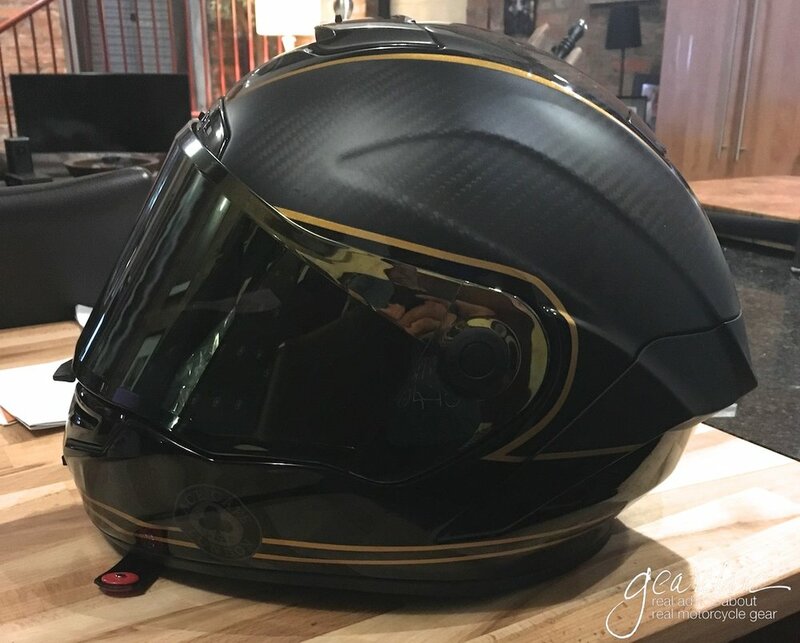 Basically the Race Star gets you a slightly lighter shell, a higher performance shell with the deeper view window in a crouch and a little more comfort with the Flex Impact Liner. It doesn't matter to me, and I think if I wore the street star I probably wouldn't have noticed a dramatic difference since I'm not topping out at 150mph on the track just yet. But what I did notice is how much more aerodynamic it was going down the straightaway at 100mph. 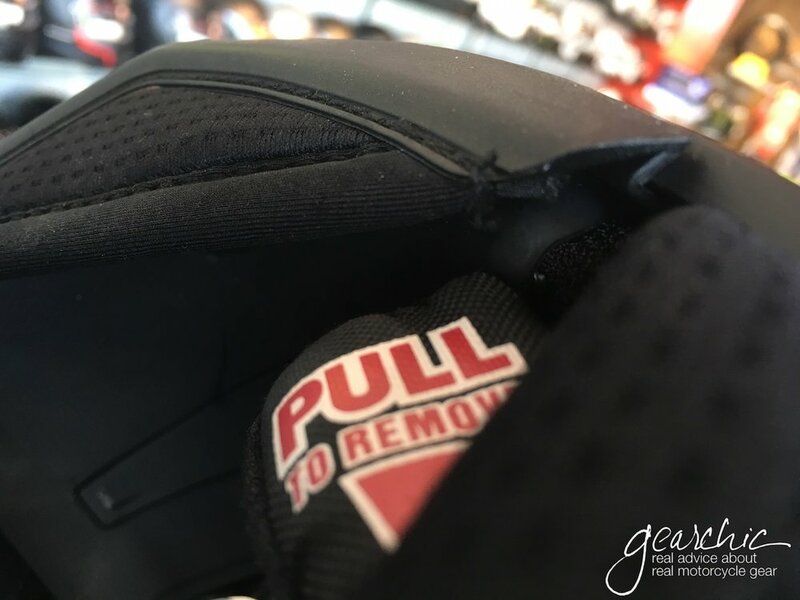 This helmet has a very aggressive line from front to back which makes it ideal in a crouch so that when you lean forward, you can actually see out the front! Notice how the faceshield almost looks like it's looking up towards the ceiling? 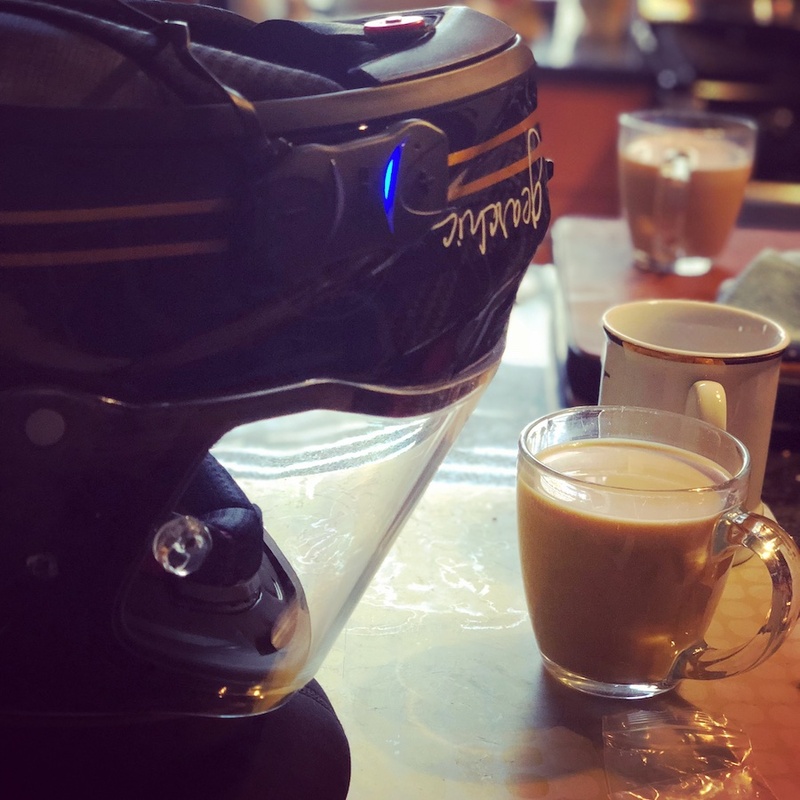 Now look at your street helmet, or modular helmet, your faceshield is probably pointing more straight ahead because that style of helmet is primarily going to be used while sitting up straight. It was extremely comfortable on the track, so that when I started to learn how to manage all the real estate the track has to offer, I didn't have any trouble finding the next turn in point, or my next marker. Seeing everything wasn't a problem. I also borrowed a mirrored gold faceshield because well, why not? Certainly helped that it was tinted since it was a bright, warm, sunny day. Noise wasn't an issue, except down the straightaway where of course the wind is blasting the loudest. With earplugs, it didn't sound that different from my Shoei. But I certainly noticed how much more aggressive it was going down the straightaway. Absolutely no resistance or turbulence approaching higher speeds. Although the shell size is a bit bigger in this Small, I didn't notice it. I think I would definitely notice if I were on the street, since I'm constantly turning my head in that situation. But on the track you're never changing lanes and looking beside or behind you because you don't have to. It also vents exceptionally well up into my face from my chin. I've worn this helmet on the street for a whopping ~60ish miles on the streets around Philadelphia. Like as soon as you start moving it feels like a fan is being blown into my face. Even with the faceshield closed and with the chin skirt attached. I have to make sure that I wear a neckwarmer (lightweight like this one which you can wear however you want) to help minimize some of the airflow into my face. Otherwise I can feel my contacts drying out. It's a little annoying and bothersome for street riding. Although I want the extra airflow in the summer, there's a point where I think it's going to drive me crazy. I can't ride with glasses either, because the vision is just not the same with contacts for me. (I've worn them since I was 13 so wearing glasses riding is just not an option). I've also installed my old Sena SMH10R Bluetooth Headset into it to see how good the sound would be in a helmet like this. Track helmets are typically not great for headsets but I figured why not? Installation was also a challenge because there are no speaker pockets. Placing them was interesting. I also hate the idea of mounting the battery on the back of the helmet. I just don't like the way it looks, which is ridiculous I know. So I decided to just tuck it under the neck roll and hope for the best. The sound isn't as great as it was in my Shoei but it definitely works. Why did they have to create a design that fully matches my Goldie?! I really didn't need this helmet but... well it certainly goes *perfectly*. The other thing that makes it hard to wear as an everyday street helmet for me is the lack of a Transitions Faceshield. I LOVE this on my RF1200 and although I bought a gold faceshield for this one, I definitely miss having the transitions aspect. The fitment on the Star line is mostly Oval. As you climb up to the Race and Pro, it turns into a Long Oval. At least that has been my experience fitting customers in the RevZilla Showroom. The slimmer your head, the more comfortable you will probably find this helmet. I consider myself an intermediate oval and that will work well too as long as you are still on the slimmish side (ear to ear). The wider your head gets, the tighter the Stars will feel. The Race Star has an even tighter fit because of the implied purpose of the helmet, Racing. As we crouch, we need our helmets to be snugger, leaner, less bulky, lighterweight, more aerodynamic. That also means that the neckline should be higher in the back. You can see in the photo below how low my chin is compared to how high my neckline is. Now look at me in my Shoei. Of course, it's a sporty, aggressive helmet but not quite as aggressive as the Bell. And that's because it isn't designed as Track Helmet. Certainly great for aggressive riding but doesn't have the exact same angle. 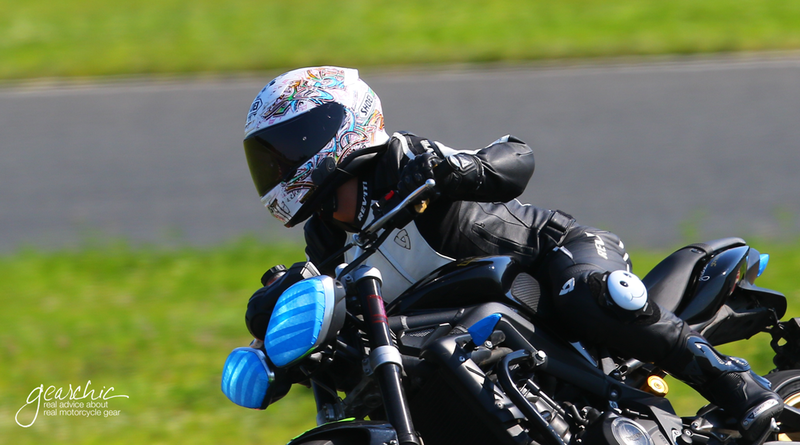 It did work okay for my previous track day but I definitely noticed how it touched the neck/back of my jacket as I started to crouch. The Bell definitely felt more comfortable on the track and I am seriously considering buying one for next year's track season. :D But, there are a couple things I wish they would refine and improve for the next version. I'm normally a size XS (54.5 cm) in helmets, but in this model I had to bump up to S (55 cm) because it has such a narrow entry, I couldn't get my head in. Luckily a 0.5cm increase didn't mean it was too long, it actually fit me quite perfectly. It was as snug as I like it (a bit snugger even than my Shoei) without any movement at all, even at 100+mph speeds. Even as I wore it for the day, I didn't feel it get too loose or change really. I suppose if I had it for a month or two that might change, and I'd certainly find it too loose if it got 15-20% looser. As far as shapes are concerned, I consider myself an intermediate oval since I don't have a tall or high forehead but I do have a pretty small head. As a track specific helmet, I really liked how the Race Star performed in terms of ventilation, wind resistance, comfort, view and weight. The good news is also that if you are borderline XXS in an oval, you'll probably fit the XS quite well. It is quite narrow. 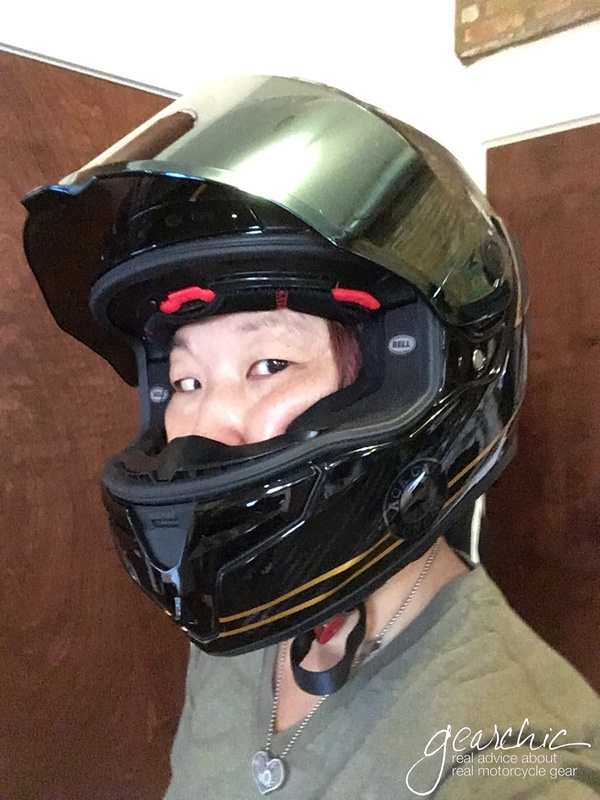 The downside is if you are a round and need a XXS helmet, because you will size up to S which might then leave you with extra space in the front. Or for those of you who are really round, you'll still find pressure points on the side of your head. If that's the case, then you'll want to consider an Arai Corsair X, a Scorpion R2000 or maybe an HJC RPHA 11 Pro. Keep in mind that the interior liners are not changeable on the Race Star, except for the cheekpads which can only be made thicker, not thinner in 5mm increments. And the shells start to get considerably larger as you bump up to L, XL sizing. I feel fortunate that I fit in S because otherwise I would look like a bobblehead in anything larger. My only real complaint about the Race Star is the finish on the inside of the chin bar where the chin skirt attaches. This doesn't interfere with the way the helmet works, it's really just a finish issue that I think they need to fix next time around. The rest of the helmet has been improved in so many ways, it just seems like they forgot this part. It's such a small detail but those details are what really set the best helmets apart from the rest. I think Bell should try to focus on making the Race Star a more street friendly helmet. Many of us love wearing cool track helmets on the street, so why not add a few comforts in case someone wants to?